Arthritis of the spine is an inevitable part of aging. Low back arthritis pain (facet arthritis) accounts for 15-40% of low back pain. The pain is often worsened by twisting the back, stretching and bending. 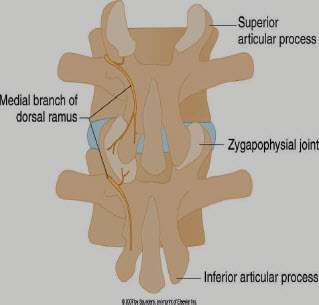 Facet joints are designed to allow movement between each vertebrae. Pain from the facet joints is primarily noticed in the low back. 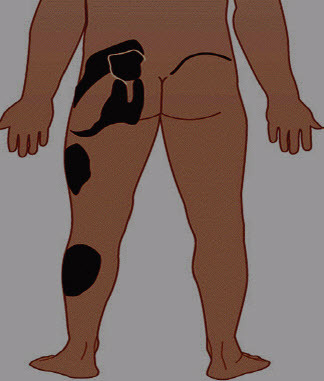 However, significant symptoms in one or both legs can be seen as in the picture to the right. 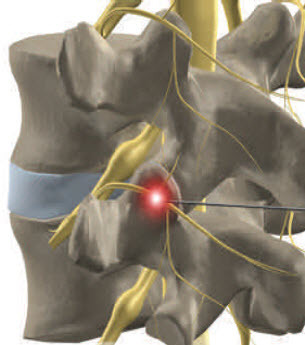 Treatment of Lumbar Facet Pain, or neck pain, can involve anti-inflammatory medication, physical therapy or injection of numbing medication and/or cortisonIe. These injections can be placed into the joint itself or around the nerves that carry pain from the joint. The choice of injection can depend upon your physician preference. Often good relief is obtained with these initial injections.